For business owners selling books online, whether they’re vintage, used, or collector’s editions, it pays to get packaging right. After all, customers who receive damaged goods probably aren’t going to recommend your business to friends and family, no matter how special the books themselves may be. While packaging books may seem intuitive, there are some special considerations worth remembering before you toss your literary treasures in a box of packing peanuts and send them on their way. Whether your books are going 20,000 leagues under the sea or on a journey to the center of the earth, following these key steps will turn habitual bookworms into loyal customers. 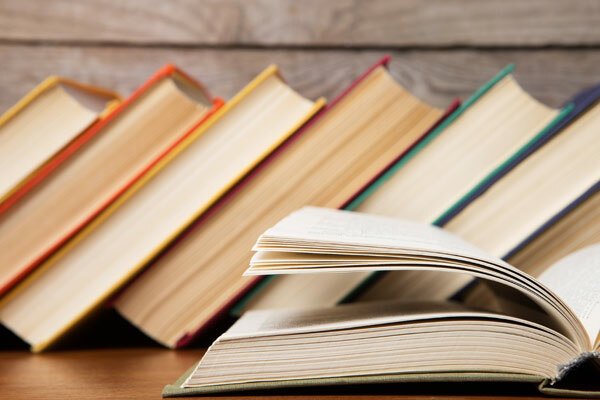 Anybody who’s thrown a paperback into their bag knows that books can take a mild beating and live to tell the tale — but wouldn’t your customers prefer that their books arrive crisp and unscathed? To make sure that each book arrives on your customers’ doorsteps in mint condition, start out by wrapping it in a protective layer of plastic wrap. In addition to keeping pages dry in case any moisture leaks into the shipping box, plastic wrap will keep the covers sealed tight, preventing damage to exposed pages. After you’ve wrapped the book in plastic, you’ll want to add one more protective layer to prevent bent corners or torn book jackets in transit. Try using cardboard on the front and back to provide support from both sides, or even enclose the book in a padded bubble mailer for an extra layer of protection. After you’ve sealed your book shut with plastic wrap and positioned the cardboard strips, wrap the book in brown kraft paper. This will keep the protective cardboard in place will adding further protection from water damage during transit. wrapping paper instead of the standard brown kraft paper. With the right material, you’ll be able to protect your products from damage and celebrate in style. Finally, you’ll need to box your books up for shipment. You should use a sturdy cardboard box that’s large enough to enclose your book while leaving extra room for cushioning materials, such as packing peanuts and shredded fill. However, be sure that it isn’t so large that books shift during transit, which increases the risk of damage. Once your packaging is secured and you’ve cushioned your book with protective material, use carton sealing tape to seal your package shut. You’re all set — bon voyage and happy reading! I’m planning to ship some books to my sister while she’s abroad, and I really want them to arrive in good condition. your tip on keeping the pages dry with plastic wrap is really helpful, and I’ll definitely try your suggestion of using cardboard to protect the cover corners. Getting some bubble wrap or packing peanuts, as you suggest, will definitely be on the list, as well, and I’ll be careful to get a box that has enough room for that.